I have already plead my addiction to sour beers, and have continued down the rabbit hole. I have 3 in bottles at this time, my first attempt at a lambic, a sour based off Bam Bier with Jolly Pumpkin dregs as the yeast/culture, and my first attempt at a Flemish red. I decided next up was going to be an Oud Bruin. Oud Bruins are like flemish reds, but they tend to be a bit bigger, and usually have less or no oak. They are aged with similar cultures as a Flemish red, but without as much barrel or forde aging, you don’t tend to get that balsamic vinegar acetic taste like you do in many Flemish reds. The very first pure sour beer I ever had, since I don’t count the fruity Lindeman’s, was an Oud Bruin, Liefmann’s Goudenband. Yeah, that was kinda like hitting a home run during your first at bat. So, I decided to try to replicate the style. The whole thing was infusion mashed at 158 for 45 minutes to try to get a very dextrinous beer, and then the extract and malto-dextrine were added in the boil. The OG was 1.076, the FG was 1.014, and the ABV is 8.1% . A few notes on this. Oud Bruins and Flemish reds both undergo primary fermentation, then are racked over. Oud Bruins are usually not put in barrels, instead being held in steel tanks. This tends to keep down the acetic nature of the beer compared to Flemish Reds, and obviously no oak. Also, I did want stronger malty notes on this, and have the Roeselare be more of a compliment then driving force. 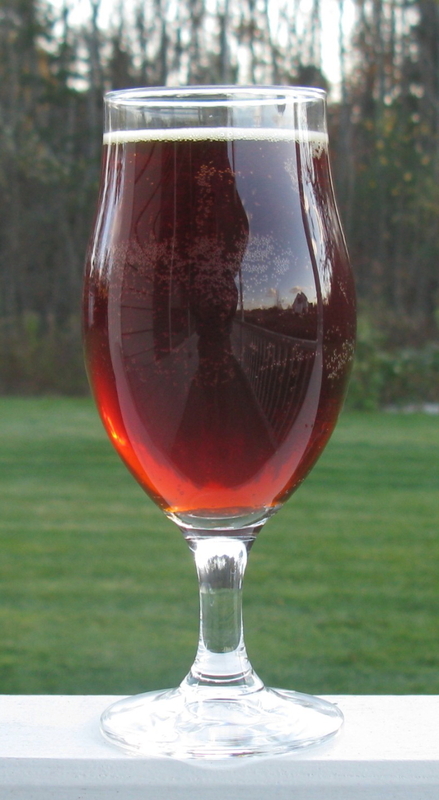 However, I was not happy with the Flemish Red I made with the Roselare in secondary. So I split my beer, and I fermented 3.5 gallons with half the Safale and all the Roeselare in the carboy this was going to age in, and then I fermented 2.5 gallons clean with the Safale, and racked that into the “bugged” carboy after it fermented with the clean yeast for 11 days. This then sat, and sat, and sat for over 1 year. I was going to bottle this at the 1 year mark, but it did not have the aroma or smell I wanted. I was actually harvesting some slurry from a Flemish I had started with ECY 02, so I tossed some of that in, and let it sit another 4 months. That really made a difference, the nose just blossomed. I also was worried about bottling a sour above 1.010, but the SG had not changed in 6 months, so I figured it was time to let it go. Tasting : The appearance is a clear, reddish brown. There is light carbonation, and the head quickly falls. The nose at first has the bright sour cherry nose, followed by that classic “baryard.” There is some caramel and raisin as well. I don’t get any acetic notes. Very aromatic. The first thing you taste is a bright burst of dark fruit, mostly cherry again, followed by some sweet malt, and then a lemony sour bite at the end. There is very little bitterness preceived. It coats the tongue nicely, has a slickness to it, and finishes with a sweet/tart tang. Critique: I hope I can reproduce this. Hands down, my best sour to date. Very complex, tons going on in the nose as well as on the palate. I really enjoy the malt profile. The sour is there, but not overpowering at all. For a malty beer, it goes down very easily, not thick or heavy, and leaves a nice aftertaste on the tongue that plays off the slight pucker of the lactic acid. I think we need to try this recipe again.